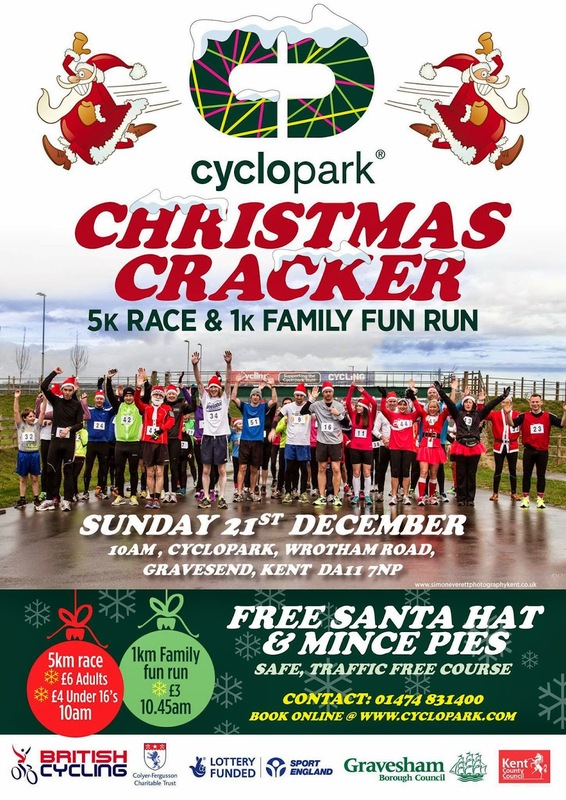 The Cyclopark Christmas Cracker had its first event in 2013 and I really enjoyed running at the venue. If you are unfamiliar with the event/venue, it's 5k and is run over two laps of the 2.5km cycling track which undulates throughout. What it takes from you in inclines it pretty much gives back with its super smooth tarmac running surface. The event also featured a 1 kilometre fun run which took place straight after the main event. We had arrived and registered on the morning. It was £6 to enter the 5k and £3 each for the 1 kilometre fun run. The Cyclopark has all the facilities you might need during your stay - lockers, toilets, a cafe etc. Once the registrations had been taken care of I headed off for a warm up around the track. At 10am the 35 runners formed on the start line and the Race Director, Steve Cable, made a few short announcements before sending us on our way. The initial lead was taken by my SLGR teammate Richey and I soon joined him and ran next to him as we approached the first hairpin corner. After this we parted company and I went off in search of a new course best time for myself. 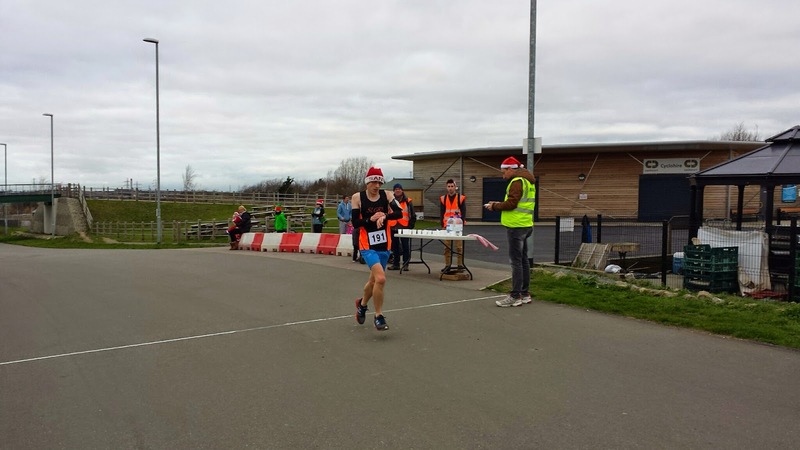 My previous best time on the course were 19.37, which I ran at the Cyclopark Christmas Cracker 2013. 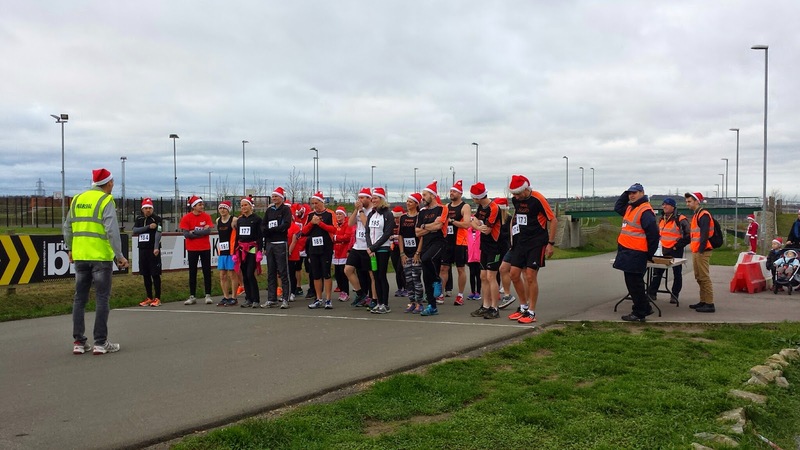 Although it was worth noting that I ran a 19.26 5k split at the Gravesend Floodlit Series 10k (December 2014) just 10 days before this event. This course was also the venue for my first sub-20 5k buggy run, which I ran back in June at the weekly Cyclorun event. With that recent 10k split in mind I was hopeful that I could possibly squeeze under 19 minutes if things went to plan. As the first lap went on the sound of other people's footsteps behind me slowly faded and I found myself running completely alone. It was a bit windy out there but the temperature was very mild at 8 degrees. 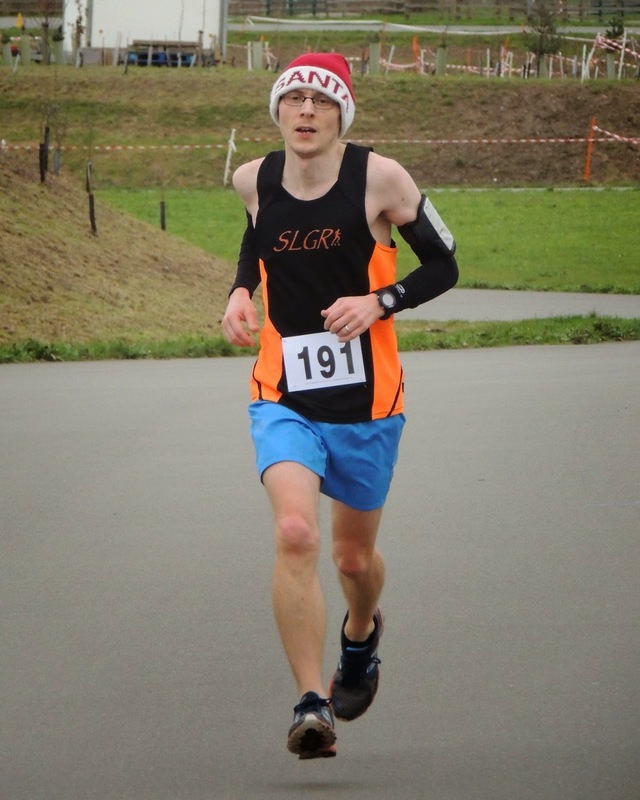 I had worn my club vest along with my arm sleeves which I found to be the perfect upper body attire for the conditions. 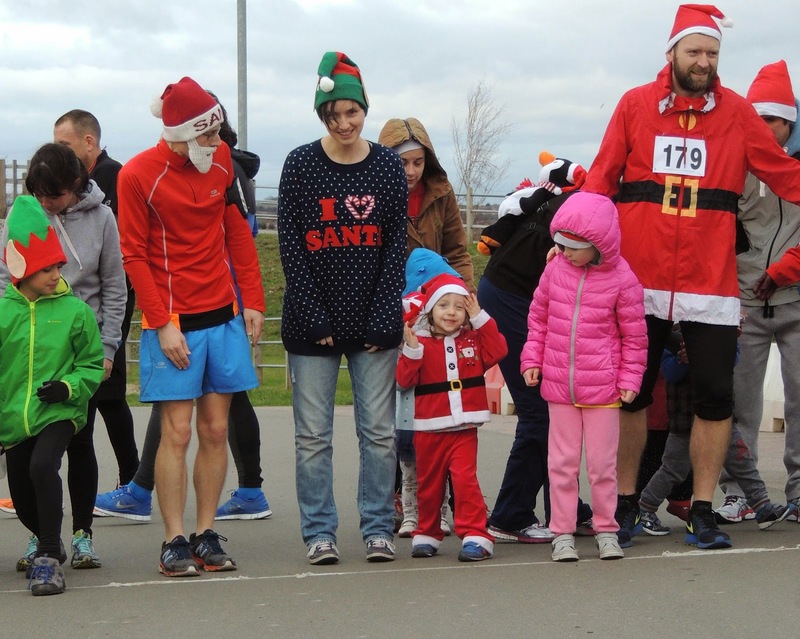 Along with this I had worn one of my Christmas hats, which although made my head a little warm, was pretty much compulsory for this type of event. I passed the halfway point in approximately 9 minutes and 26 seconds and picked up a great hi-five from Matilda, then headed on to complete lap two in a similar time. Eventually coming in with an official finishing time of 18.48. 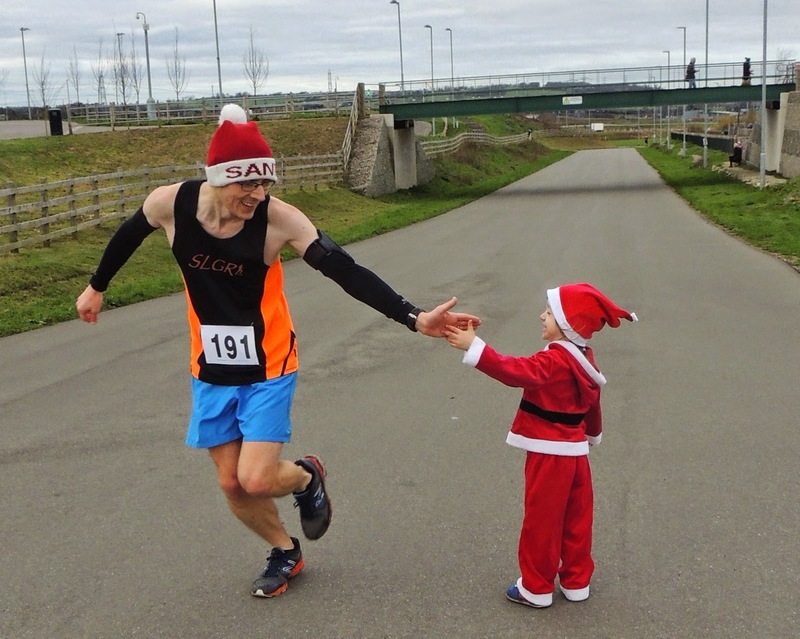 Once I had finished, I looked back down the long incline that I had just run along and there was still no sign of the second placed runner, he eventually come in 1 minute and 47 seconds behind me. At 10.45am it was time for the 1k fun run. Somehow between finishing the 5k and starting the 1k, I had grown a white beard! 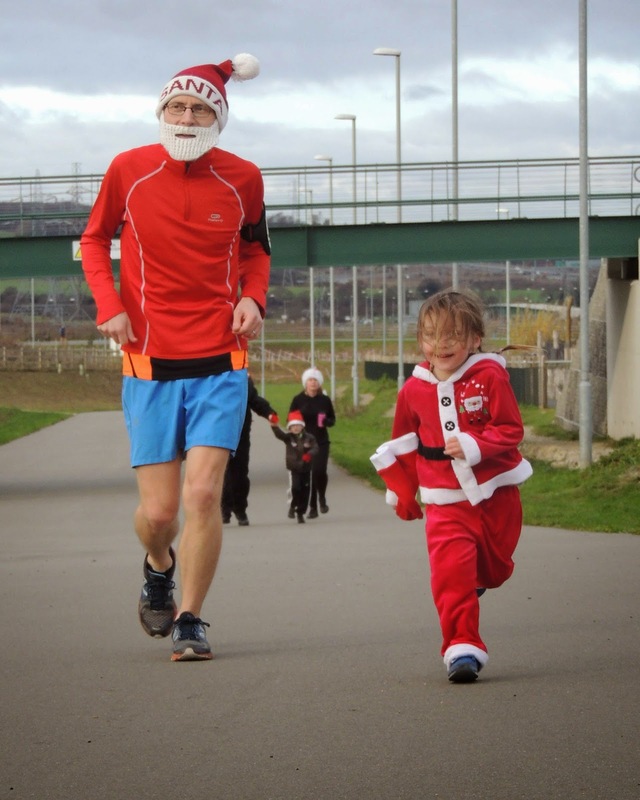 At 2013's event I ran this with Matilda in her running buggy, but over the course of 2014 she had started running herself. So this year, the whole family ran it together. All the way around she kept a steady pace and when it came to the last section on the long incline, she just plodded away as if it was a flat piece of tarmac - I'm very impressed with her natural pacing skills. Once we had finished we popped into the main Cyclopark building to warm up and to have a complimentary mince pie. The official results were posted to the Cyclorun Facebook page a short while later. We had a great time and we'll be looking to be back for 2015's event!